THE FRAME IS a bit smoky. Nothing like the ultra HD experience we get today. But, the little girl framed by the trees and the bushes holds our attention. Clad in a short floral dress, her hair in pigtails, she behaves a little bit like a deer caught in headlights. Carrying a small, empty pot, she makes her way daintily through the undergrowth. The grassy field in front of her is all empty, but for a tethered, white cow. And, then, the camera zooms in on a crumbling grave in the long grass. The child’s face changes dramatically. Her lips quivering, her eyes spilling tears, she falls to her knees by the grave. “Amma, my hands are hurting,” she wails, holding up her scarred palms. “Are you watching me? I’m always working. Yet, the Ammachi [older lady] scolds me, beats me. Amma, why did you leave me with her?” Realising that she has been away for long, she rises and bids farewell to the silent grave: “Amma, I’m going. If it gets too late, Ammachi will thrash me.” And, with many a longing look at the grave, the child walks out of the frame, leaving us alone in the long grass, in that desolate field bordered by toddy palms. That was a glimpse of Sridevi in Poombatta (1971). That role got her her first award: Kerala State Film Award for Best Child Artist. I was blown away by the strength of emotions portrayed by that eight-year-old child. At an age when other children are learning to tie shoelaces, Sridevi was a consummate professional. And, that was a trait she continued to display till the very end. Hence, this week’s cover. Our tribute to The Last Diva. While our columnist Shobhaa De analyses Sridevi’s life and the challenges that come with great beauty and greater talent, the exclusive element is Sachin Tendulkar’s tribute as a fan. When Manoj Warrier, an integral part of Team Sachin, told me that the cricketing legend admired Sridevi, I was sure that I wanted his tribute in this issue. When Sachin and I meet in Kochi during Kerala Blasters’ games, our conversations mostly revolve around sport, and our cheers are reserved for the home side. So, this was a revelation. And, I was impressed by that one trait he admired in Sridevi: timing. Cricket fans have been awestruck by his timing in the middle. And, now, he says he was awestruck by hers! Thank you, Sachin, for wearing your heart on your sleeve this once. It is often the attention to detail that separates average practitioners from geniuses. I’ll stop with an anecdote narrated by Dhanya Kiran, news anchor with Manorama News. Kiran was a child artiste in director Bharathan’s Devaragam (1996), in which Sridevi essayed the female lead. 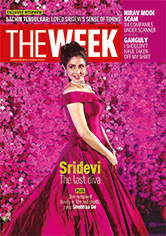 Kiran says Sridevi was most affectionate to her. One scene was shot over two days, and on the second day, Sridevi said that there was something amiss with Kiran’s hair. She was wearing it in a single plait that day, because the makeup notes said so. When the movie came out, Sridevi was proved right. Kiran had worn her hair in two plaits on the first day! In Sridevi’s passing, we have lost not only beauty, but a gifted actor, whose professionalism extended to things beyond her own role.